The Cubs are on their first winning streak of the season, but now they turn to the struggling Kyle Hendricks, who'll look to keep the Chicago pitching staff rolling in the second of three at Wrigley against the underdog Angels, who remain without the two-time AL MVP. The Cubs are on their first winning streak of the season, but Saturday they turn to the struggling Kyle Hendricks, who'll look to keep the Chicago pitching staff rolling [in the second of three](https://www.betchicago.com/mlb-betting/coverage/1e779415-cf5e-4f41-8e1e-6a3deaeee0c7) at Wrigley against the underdog Angels, who remain without two-time AL MVP Mike Trout. Trout [injured his groin](https://www.youtube.com/watch?v=9UbH99LacWc) sliding into second base in Tuesday's win over the Brewers and hasn't played since. He will miss at least both games this weekend, [said Los Angeles general manager Billy Eppler](https://www.mlb.com/angels/news/mike-trout-out-of-lineup-in-opener-against-cubs), but manager Brad Ausmus added before Friday's game that Trout is unlikely to go on the injured list. The Cubs (5-8) are -176 favorites as of Saturday morning for the 1:20 p.m. CT game, which will be aired locally on ABC7. Chicago has won two straight and three out of four on its first homestand of the season after [Friday's 5-1 win](https://www.betchicago.com/mlb-betting/coverage/9bb6feb8-b81e-478e-afb5-38ca098359a4/boxscore). It was a cold day in the Windy City (as [it'll also be Saturday](https://weather.com/weather/tenday/l/USIL0225:1:US)), but the Cubs' bats were hot, as Willson Contreras had his fifth multi-homer game in four seasons with the Cubs, and Anthony Rizzo and David Bote also went deep. __MORE:__ [Hold off on Rays World Series bets despite hot start](https://www.betchicago.com/reasons-hold-off-world-series-rays-bets-futures) <a href="https://twitter.com/NBCSCubs/status/1116794494681145344" class="embedly-card" data-card-width="100%" data-card-controls="0">Embedded content: https://twitter.com/NBCSCubs/status/1116794494681145344</a> Chicago's staff has allowed five earned runs the last four games, and Yu Darvish gave up four of them. But Hendricks (0-2, 6.48 ERA) hasn't pitched yet at Wrigley, and he's had tough outings in losses in Atlanta and Milwaukee. The 29-year-old, who signed a 4-year, $55.6 million deal this offseason, has allowed an astounding 22 baserunners in 8 1/3 innings, and three home runs. His home ERA in six seasons with the Cubs is 2.74 as opposed to 3.48 on the road, so maybe a return to Wrigley will get him back on track. Chris Stratton (0-1. 6.48), a 28-year-old righty who was with the Giants the last three seasons, gets the start for the Angels (7-7). He has pretty similar numbers as Hendricks through two starts -- the same ERA, plus 17 baserunners allowed in 8 1/3 innings. He's pitched five innings in his career at Wrigley, and he allowed home runs to Javy Baez and Kyle Schwarber in that start, so expect some balls to fly out of the yard Saturday. 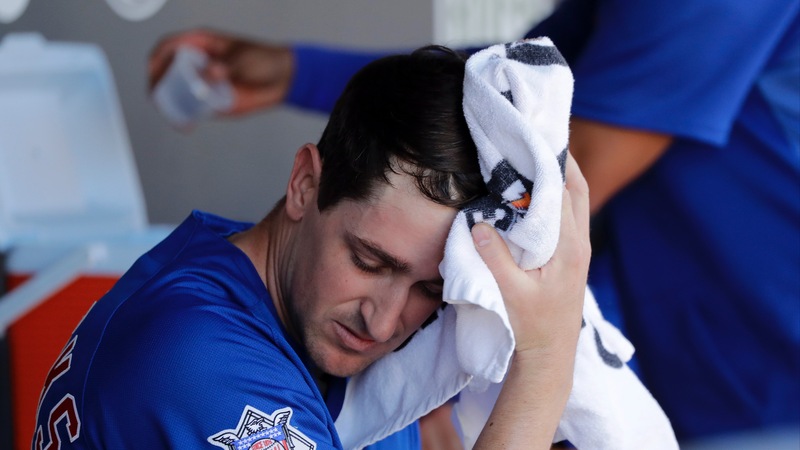 If you like the underdogs, consider [Hendricks' first-inning struggles](https://www.nbcsports.com/chicago/cubs/how-kyle-hendricks-plans-combat-his-first-inning-woes-yelich-trout-bullpen-opener) and maybe take the Angels F5, though I'd avoid it. Three straight Cubs games have gone UNDER their total, and four of five, after the OVER was 7-0-1 in their games to start the season. The OVER is a league-worst 2-12 in Angels games. Expect Hendricks to right the ship in his first home start of the season and the Cubs to keep rolling. Take Chicago -176. For fantasy advice, give L.A.'s Zack Cozart a look if you have injuries in the middle infield. He's available at second base, shortstop and third base in Yahoo fantasy leagues, and he's 4-for-12 with a double and home run in his career off Hendricks. __MORE:__ [Our complete MLB coverage](https://www.betchicago.com/mlb-betting/home) ## Saturday baseball odds, probable pitchers *Odds from the Westgate SuperBook as of Saturday morning. Check [our MLB odds page](https://www.betchicago.com/mlb-betting/odds) for updated betting lines. All times Central. __White Sox (+160) at Yankees (-170), 12:05 p.m., MLB Network (regional); Total: 9.5 (OVER -110)__ CWS: 4-8 NYY: 5-8 Pitching matchup: CWS RHP Ivan Nova (0-1, 7.71) vs. NYY LHP CC Sabathia (season debut) Betting note: Nova, who'll be pitching against his former team, had a 5.42 road ERA last year for the Pirates, but he allowed only one run in seven innings April 1 in Cleveland. __Orioles (+210) at Red Sox (-240), 12:05 p.m., MLB Network (regional); Total: 10.5 (OVER -120)__ BAL: 5-9 BOS: 5-9 Pitching matchup: BAL RHP Andrew Cashner (2-1, 5.28) vs. BOS RHP Rick Porcello (0-2, 13.50) Betting note: Porcello has allowed 16 hits, including three home runs, and seven walks and 7 1/3 innings. He'll be making his 2019 debut at Fenway, where he allowed 17 home runs in 15 regular-season starts. __Tigers (+170) at Twins (-185), 1:10 p.m.; Total: 8 (UNDER -110)__ DET: 8-5 MIN: 6-4 Pitching matchup: DET RHP Tyson Ross (1-1, 2.25) vs. MIN RHP Michael Pineda (1-0, 2.00) Betting note: Six of the last eight Minnesota games have gone OVER, but all but one was on the road. The UNDER is 10-3 in Detroit games. __Angels (+163) at Cubs (-176), 1:20 p.m.; Total: OFF__ LAA: 7-7 CHC: 5-8 Pitching matchup: Stratton vs. Hendricks Betting note: Chicago is 3-1 at Wrigley after going 2-7 on its opening road trip. __Rays (-185) at Blue Jays (+170), 2:07 p.m.; Total: 8 (UNDER -110)__ LAA: 7-7 CHC: 5-8 Pitching matchup: TB LHP Blake Snell (2-1, 2.84) vs. TOR RHP Clay Buchholz (season debut) Betting note: Tampa Bay has won 12 of its last 13 games when Snell starts dating back to last season. __Rockies (+120) at Giants (-130), 3:05 p.m., FS1; Total: 7 (UNDER -110)__ COL: 3-11 SF: 6-9 Pitching matchup: COL LHP Kyle Freeland (1-2, 5.40) vs. SF LHP Madison Bumgarner (0-2, 3.32) Betting note: Colorado has the majors' longest losing streak at seven. __Pirates (+110) at Nats (-120), 3:05 p.m.; Total: 8.5 (UNDER -110)__ PIT: 7-5 WSH: 6-6 Pitching matchup: PIT RHP Chris Archer (1-0, 2.45) vs. WSH RHP Anibal Sanchez (0-1, 6.52) Betting note: The OVER is 9-3 in Washington games. Sanchez is starting in place of Max Scherzer, who was pushed back a day after being hit in the leg Sunday against the Mets. __Phillies (-155) at Marlins (+145), 5:10 p.m.; Total: 8 (UNDER -120)__ PHI: 8-4 MIA: 3-11 Pitching matchup: PHI RHP Zach Eflin (2-0, 0.75) vs. MIA LHP Caleb Smith (0-0, 4.09) Betting note: Miami has the worst run differential in the league at -39. __Cardinals (-128) vs. Reds (+118), 6:10 p.m. (in Mexico); Total: 10.5 (UNDER -110)__ STL: 8-5 CIN: 4-8 Pitching matchup: STL RHP Adam Wainwright (1-0, 4.50) vs. CIN RHP Tanner Roark (0-0, 5.79) Betting note: Cincinnati had lost eight straight before outscoring Miami 21-1 in a three-game sweep. __Indians (-110) at Royals (EVEN), 6:15 p.m.; Total: 9 (OVER -115)__ CLE: 8-5 KC: 3-10 Pitching matchup: CLE RHP Jefry Rodriguez (season debut) vs. KC RHP Homer Bailey (0-1, 9.00) Betting note: Rodriguez is starting in place of Mike Clevinger, who is out at least six weeks with an upper back strain. __Mets (+120) at Braves (-130), 6:20 p.m., FS1; Total: 9.5 (UNDER -110)__ NYM: 9-4 ATL: 7-6 Pitching matchup: NYM LHP Jason Vargas (1-0, 9.00) vs. ATL LHP Sean Newcomb (0-0, 1.64) Betting note: New York has scored at least six runs in six straight games, tying a franchise record. __A's (-111) at Rangers (+101), 7:05 p.m.; Total: 11 (UNDER -120)__ OAK: 10-8 TEX: 6-7 Pitching matchup: OAK RHP Marco Estrada (0-1. 4.87) vs. TEX RHP Adrian Sampson (0-1, 1.86) Betting note: Oakland has won four straight, and six straight A's games have gone OVER. __Padres (-104) at D-backs (-106), 7:10 p.m.; Total: 9 (OVER -120)__ SD: 10-5 ARI: 6-8 Pitching matchup: SD LHP Matt Strahm (0-2, 7.04) vs. ARI RHP Merrill Kelly (1-1, 2.57) Betting note: San Diego has won three straight, and Arizona has lost three straight. __Brewers at Dodgers, 8:10 p.m., MLB Network (regional); Total: OFF__ MIL: 9-5 LAD: 8-7 Pitching matchup: MIL RHP Zach Davies (1-0, 1.69) vs. LAD LHP Caleb Ferguson (0-0, 0.00) Betting note: Los Angeles has lost five straight and was favored in four of the five. __Astros (-190) at Mariners (+175), 8:10 p.m., MLB Network (regional); Total: 8.5 (UNDER -120)__ HOU: 9-5 SEA: 13-3 Pitching matchup: HOU RHP Justin Verlander (1-0, 4.24) vs. SEA RHP Felix Hernandez (1-0, 4.26) Betting note: Houston has the longest winning streak in the majors at seven games, while Seattle is 8-2 in its last 10. __PLAY:__ Our [free daily contests](https://betchicago.chalkline.com/games/mlb-daily-pick-5), including [MLB Daily Pick 5](https://betchicago.chalkline.com/games/mlb-daily-pick-5), for the chance to win a BetChicago prize pack.